The A380 will feature the revolutionary First Apartments, which are fully private suites with a separate reclining lounge seat and full-length bed, as well as a chilled mini-bar, personal vanity unit and wardrobe. Etihad Airways has allocated the upper deck of the A380 to its premium cabins. On the B787, Etihad Airways has designed an enhanced First Suite, adding many new features including a chilled mini-bar. Etihad Airways is introducing the latest Panasonic eX3 entertainment system across both fleets, providing more than 750 hours of on-demand entertainment, improved gaming and high definition screens across all cabins. The system has video touchscreen handsets, offering an additional screen for guests to maximize their entertainment, so they can play games or view the moving map while watching a movie. Noise cancelling headsets are provided across all cabins, with built-in magnetic audio jacks to ensure the best sound quality. The A380 aircraft will have full mobile and Wi-Fi service while the B787 will be equipped with Wi-Fi. The Residence, which is certified by the European Aviation Safety Agency (EASA) for single or double occupancy, offers levels of luxury and total privacy normally found only on private jets. Each Etihad Airways A380 will offer a boutique version of The Residence with different color palettes, table marquetry and custom carpets. Guests in The Residence will have the services of a personal Butler throughout their flight. These fully trained service professionals will receive specialist training at the Savoy Butler Academy in London. Guests in The Residence will also have a dedicated VIP Travel Concierge team who will ensure every detail of their travel experience, including ground transport, cuisine, and amenities, are tailored to their requirements. Etihad Airways will redefine First Class and set a remarkable new industry standard with the launch of the First Apartment on the A380. Nine First Apartments will be installed on the upper deck in a 1-1 configuration creating the only single aisle First Class cabin in the industry. Each First Apartment, which has a 64 inch high sliding door, includes a reclining armchair and a full-length ottoman, both upholstered by Poltrona Frau. The ottoman transforms into a separate 80 inch long fully flatbed. The First Apartment, which also includes unique features such as a chilled mini-bar, a personal vanity unit and a swiveling TV monitor for viewing from either the seat or the bed, has a 74 per cent larger footprint than the airline’s current award-winning First Class Suites. A fully equipped shower room is available on the A380 for exclusive use by First Class guests. On the B787, Etihad Airways has designed an enhanced First Suite with many new features. The eight First Suites in a 1-2-1 configuration along a unique curved aisle, another first in commercial aviation. Each completely private First Suite has a large seat and ottoman, both upholstered by Poltrona Frau, which converts into an 80.5 inch long full-flat bed. On the centre seats, the armrests retract and the suites can be joined to create a ‘double’ bed. Other features include a chilled mini-bar and a 24 inch TV monitor. On both the A380 and the B787, Etihad Airways will launch its new Business Studios which provide 20 per cent more personal space than the airline’s current business class seat. Configured 1-2-1 in a forward and aft ‘dovetail’, the Business Studios all have aisle access and the seat converts into a fully flat bed of up to 80.5 inches long. With its privacy, ample storage and surface space, the Business Studio has been designed with the diverse needs of the premium business or leisure traveller firmly in mind. On the Airbus A380, First and Business Class guests will be able to relax in The Lobby which is a serviced lounge and bar area located between the First and Business cabins. Providing a semi-circular leather sofa, a marquetry table and a large TV screen, The Lobby is designed for relaxing and socialising. The TV has a USB connection so it can be used for sharing content or it can also be set to the airline’s Live TV channels for sporting and other events. 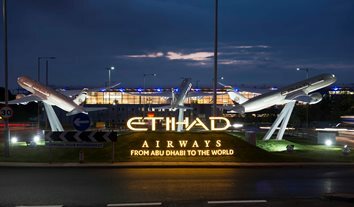 A key design objective for Etihad Airways was to transform the boarding experience making it more akin to stepping into the lobby of a boutique hotel. In all entry-ways in both aircraft and in all cabins, the galley equipment is concealed behind custom Arabic fretwork screens and blinds, while the trolleys are covered by elegant wood-finish doors, setting a stylish and welcoming environment for all guests.